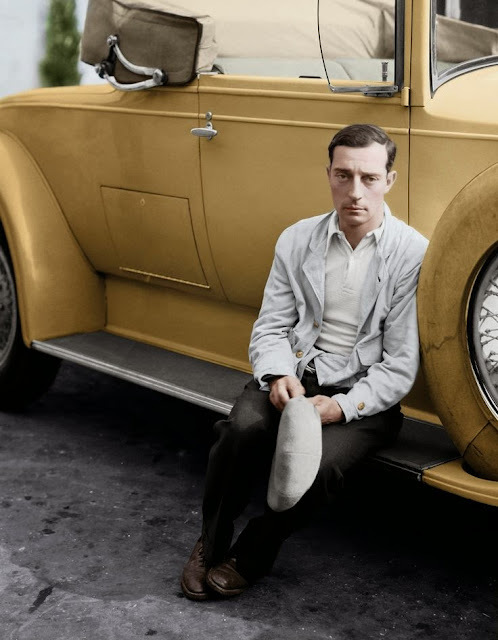 Joseph Frank "Buster" Keaton (October 4, 1895 – February 1, 1966) was an American actor, director, vaudevillian, comedian, filmmaker, stunt performer, and writer. In many of his classic roles, he did all those things at once. 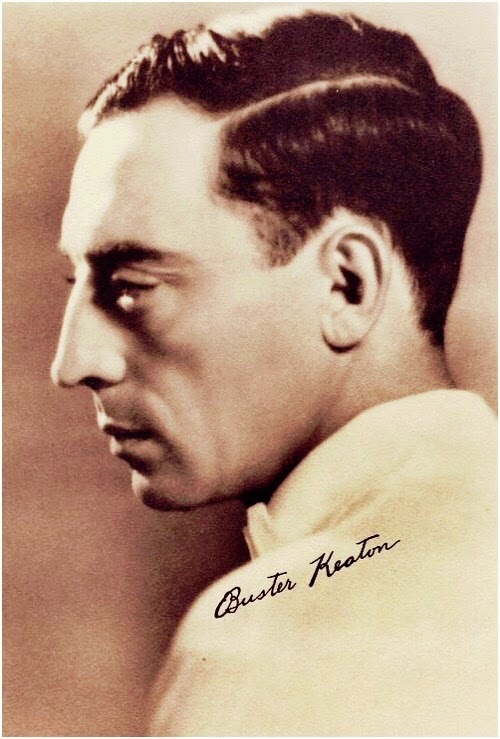 Buster was best known for his silent films, in which his trademark was a physical comedy with a consistently stoic, deadpan expression, earning him the nickname "The Great Stone Face"
There's no need to go through Buster Keaton's entire career here. It speaks for itself: either you are a fan and know all about him, or you probably barely know the name and this type of page either pique your interest to learn more - or it doesn't. Let's just say that Buster Keaton was one of the true originals in American cinema, and he did things that even today are difficult to believe even as you watch him do them. Buster made his career in a back-handed way: unlike just about everyone else in Hollywood with the possible exception of Harold Lloyd, he was more popular and famous for his stunts, which he invariably did himself, than he was for his actual acting. Hardly a funnyman in person, he was riotously funny when bearing his steadfast grimace as all manner of calamities befell him. The inspiration was all his, as Buster served as his own director virtually throughout his career (though the actual directors might take issue with that regarding some of his mid-career appearances). If looked at as a meal, the Buster Keaton oeuvre comprises an astounding hors-d'oeuvre, appetizer and salad that could have served as a complete meal by themselves, a wayward main course that somehow fell off the cart on the way to the table but was still tasty once the dirt was brushed off, and an epic, flaming dessert and cognac chaser. Buster was simply otherworldly with his silent film stunts, but the sound years did not treat him kindly at first despite the fact that he had an acceptable voice. However, eventually, Keaton pulled himself together and appeared in late-career classics such as "Sunset Boulevard" and "Limelight" that cemented his legacy. Buster Keaton ended his career as he began it, with a wildly funny comedy, 'A Funny Thing Happened on the Way to the Forum,' marking with finality one of the great - and most unexpected - comebacks in Hollywood history. His ability to reach the kids of the '60s with a sequence of character actor appearances in beach blanket films was a reflection of the inner brilliance and perseverance of the man, who knew what 'funny' was and handled the transition from slapstick comic to comic character actor with aplomb. The house was a bit more elaborate than the usual one he worked with (see above) and it actually hit Keaton's arm (it may have shifted ever so slightly as it came down, these were real stunts). However, he came from a time when the shot was all that mattered. You can't tell he's in deadly pain even after you look at this scene over and over again. Buster made the most painful stunts look almost like he was an animated character in a live-action film. Everybody thinks someone can do this - but it is incredibly wrenching and difficult, requiring absolutely perfect timing and an incredible grip. This had to be worked out with extreme precision, but you can't even tell how incredibly difficult it must have been for Buster to hang on to that descending gate as it changed orientation. Yes, it looks easy. They used to do stuff like this. They sure don't anymore. It looks easy and safe - it wasn't, even for an experienced pro like Buster. When you look at this, it's easy to go 'well, he was running, so his momentum did the work for him.' Yes - but note that the gap is over twice as wide as Buster is tall. Even with the height difference, that is an incredibly athletic long jump feat, and to keep running after making it is even more incredible. I believe this is from the classic 'The General,' which Orson Welles called possibly the best film ever made. You think that was easy? Perfect timing on a moving train with a bulky piece of wood? Incidentally, it would have been quite easy for that wood to smack him but good as it came up - notice how he expertly leans back afterward. Oddly, while this stunt looks the easiest, this may have been the most dangerous stunt on the entire page. If his clothes get caught in that mechanism - he's a goner. How Buster pulled this off is tough to know, since it violates all sorts of rules of physics. He must have had wired attached. He had to have wires attached. Oh, and watch carefully - he never drops the hat.